This good luck saying dates way back to Victorian times and today, it may be one of the most infamous wedding traditions that many brides partake in. Something old represents the link with the bride's family and the past. Many brides accessorise their wedding attire with a piece of antique family jewelry or a mother's or grandmother's wedding veil or pieces of their gown – we love this, especially seeing the mother or grandmothers pride in seeing their beautiful bride is something so dear to their hearts Something new represents good fortune and success in the bride's new married life. The stunning wedding gown is often chosen as the new item. Something borrowed is used to remind the bride that friends and family will be there for her and her new husband when help is needed. The ‘something borrowed’ might be something such as a piece of jewelry or a handkerchief. 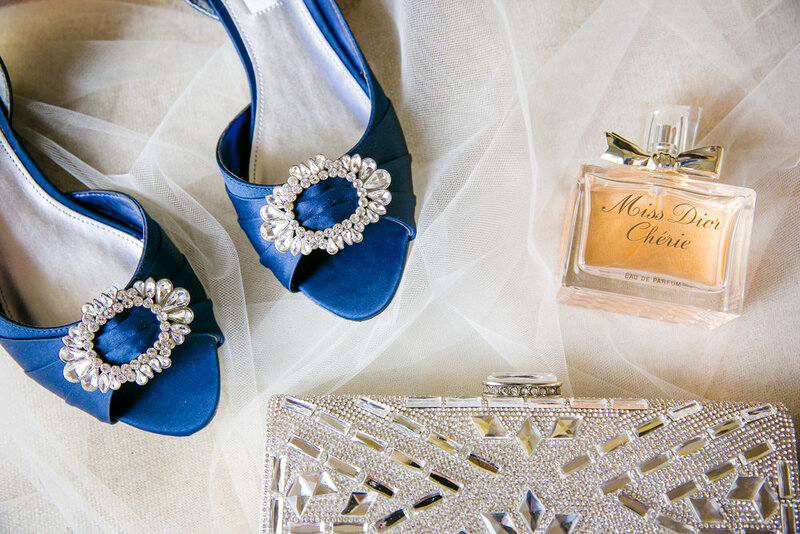 Something blue is used to symbolize faithfulness and loyalty, most often the blue item is the garter, but we have seen lots of pretty blue details incorporated into the dress, such as beautiful shoes. Last but not least, a silver sixpence in the bride’s shoe is to wish the bride and her new husband wealth. With Charleston being located on the southeastern coast, we are no stranger to rain! Although we are always prepared to make your beautiful day run as smoothly as possible despite torrential downpours, some couples abide by this old southern folklore of burying a bottle of bourbon at the site of their wedding in order to ward off any rain that might put a damper on their big day! According to the tradition, it must be done exactly one month prior to the wedding (who doesn’t need another excuse to visit the Holy City? ), the bottle must be completely full, and buried upside down to ensure maximum results! Whether or not the bourbon proves successful, be sure to dig it up post ceremony and enjoy while looking at your stunning new wedding photos! 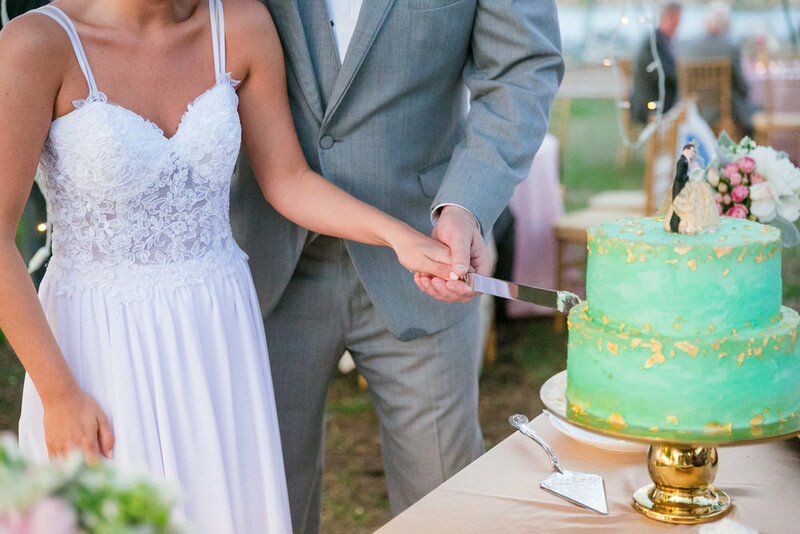 The wedding cake has always been a beautiful center piece of any wedding, and the tradition of breaking the cake over the bride's head dates back to the Ancient Romans (we are sure you are very glad we have moved past that!). Today the cutting of the cake has become one of the most classic elements of the reception, that also happens to be one of our favorite photo opportunities! It is symbolic as the first task the newlyweds perform together and sharing a piece of cake symbolizes their union and the promise to provide for each other. Through out time as cakes went from simple to elaborate, multi-tiered pieces of yummy art, it became almost impossible for the bride to cut the cake on her own, she needed her new husband's muscles to help her cut through the layers of delicious frosting. Despite many cakes now being delicate and much easier to slice, the bride and groom still cut the cake together, and why not? Your guests and photographers love it! In ancient times the now cherished practice of the ‘honeymoon’ began. The Teutonic people only held weddings under the full moon. After the wedding celebration, the bride and groom would drink honey wine for a full moon cycle - thirty days. This became known as the "honey moon." While the name endured, the purpose of the honeymoon obviously changed, but we are still advocates of toasting a glass of bubbly every day for thirty days! After the wedding, newlyweds would say goodbye to their family and friends to go and start their life as the new Mr. + Mrs. ( Send-offs are such a great photo opportunity, whether or not you're leaving straight away for your honeymoon or waiting!) Today that purpose continues, only now a fun vacation is included, usually to a sunny beach resort or your favorite city! Check out our guide to your honeymoon essentials!